Gum on My Shoe: FREE ANNIVERSARY GIVEAWAY! On October 15, 2012, Fran suggested to me that I could write a book about what it is like for me to be friends with someone with illness (specifically bipolar 2 disorder, chronic fatigue and fibromyalgia). A year on, our book, “Gum On My Shoe”, is well underway, and we are holding a FREE GIVEAWAY to celebrate the anniversary of its conception. The giveaway prize is rather special and is our way of saying thank you for all the support we have received in the past year, and continue to receive. 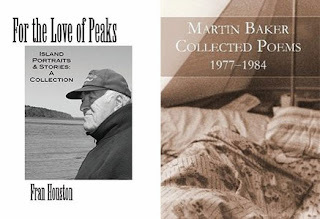 The lucky winner will receive a free copy of my poetry book, "Collected Poems: 1977–1984", and a free copy of Fran's book "For the Love of Peaks: Island Portraits & Stories", and some other nice things too! To be in with a chance all you have to do is leave a comment here on this Gum On My Shoe blog post, or sign up to our FREE Gum On My Shoe email list. Do remember to leave your name! I will draw one name at random on Saturday October 19, 2013, and will announce the winner here on the blog, so keep an eye out so you can pass me your postal address if you win! Happy Anniversary of your book! What an exciting time! Can't wait to read it when you are finished! 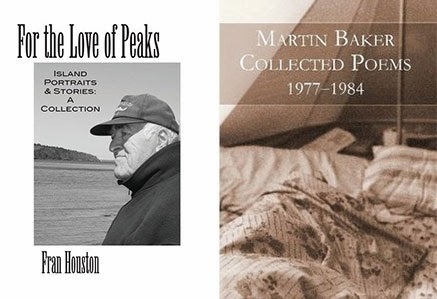 Congratulations on the Anniversary of your Book! I look forward to reading the book when it's completed! Wishing you and Fran all the best as you continue this beautiful and Inspiring Journey together! So looking forward to the day your book comes to fruition. What a great gift to the world. The giveaway is now closed ~ the lucky winner is Fran C Vit, who entered via the newsletter email list. Thanks everyone who took part! Congratulations Marty and Fran! What a great venture for you both, as well as for your fans/audience! I know I have learned so much from you already! ANNIVERSARY GIVEAWAY ~ A WINNER IS ANNOUNCED!